Drs Eric Thrane and Rory Smith, from the ARC Centre of Excellence for Gravitational Wave Discovery (OzGrav) and Monash University, were part of the team involved in last year's discovery and were also part of the team involved in the detection of first gravitational-wave discovery in 2015, when ripples in the fabric of space time generated by the collision of two black holes in the distant Universe were first witnessed, confirming Albert Einstein's 1915 general theory of relativity. 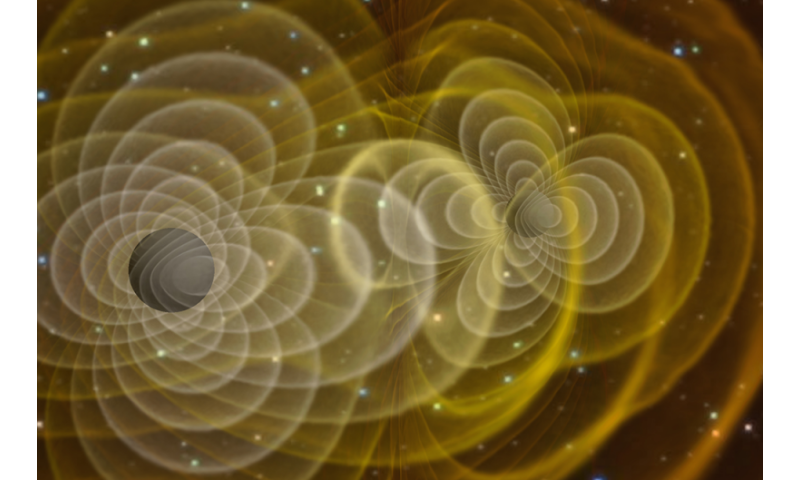 In a landmark paper in the US journal, Physical Review X, the two researchers have developed a new, more sensitive way of searching for the gravitational-wave background. "Measuring the gravitational-wave background will allow us to study populations of black holes at vast distances. Someday, the technique may enable us to see gravitational waves from the Big Bang, hidden behind gravitational waves from black holes and neutron stars," Dr Thrane said. The researchers developed computer simulations of faint black hole signals, collecting masses of data until they were convinced that - within the simulated data - was faint, but unambiguous evidence of black hole mergers. Dr Smith is optimistic that the method will yield a detection when applied to real data. According to Dr Smith, recent improvements in data analysis will enable the detection of "what people had spent decades looking for." The new method is estimated to be one thousand times more sensitive, which should bring the long-sought goal within reach. According to OzGRav Director, Professor Matthew Bailes, the supercomputer will allow OzGrav's researchers to attempt these kind of landmark discoveries. "It is 125,000 times more powerful than the first supercomputer I built at the institution in 1998." The OzStar computer differs from most of the more than 13,000 computers used by the LIGO community, according to Dr Smith, including those at CalTech and MIT. OzStar employs graphical processor units (GPUs), rather than more traditional central processing units (CPUs). For some applications, GPUs are hundreds of times faster. "By harnessing the power of GPUs, OzStar has the potential to make big discoveries in gravitational-wave astronomy," Dr Smith said. Black hole pair born inside a dying star? Can someone explain how two black holes can merge during a time frame measurable by us? My understanding is that as anything approaches a black hole its time line becomes dilated to the point that it will stop at the event horizon and there never fall through during the time of any observer. So any observer will never see or measure or sense any two black holes merge. Black holes are at best a collection of foam balls with each black hole that ever was stuck and frozen together into a snowball foam of innumerable event horizons with each black hole individual and distinct singularities that came close enough to stick but never merged. @TopCat: Good question. I understand the same as you, and the only way 2 BHs will collapse in a finite time is if we also fall into one of them. That would certainly happen if the universe fell back into itself one day; otherwise it may never happen. Anyway, form the point of view of gravitational waves that would not be an issue, as these waves are produced way before the final fall. The "foam ball" idea is an interesting one. A BH surface (of a small thickness, so not exactly a surface) would contain the whole history of the BH. This I think led to the principle of holography for BHs and the universe. Relative to their own timeframes, two merging black holes would seem to take forever to merge. But we are outside their timeframes. Relative to us, they merge quickly. Right, the time dilation increases as the observer gets deeper into the gravity well. To those of us outside, they merger happens quickly. That "whoop" gravity wave signature is the final moments of the dance, as the two BH orbits spiral in closer and faster, like a coin going into one of those big funnels. If I'm reading this article correctly, they are going to be able to tease the additional information out of the data captured by the existing detectors. This thing just keeps getting more and more impressive! Black holes are faerie tales told by plasma ignoramuses, they are but imaginary maths constructs devised for a gravity only cosmology. The hum is from plasma processes such as electric discharges in the plasma. Oh dear. More EU woo from cantthink85. @cd: Then how do they pick the hum with huge light interferometers? I thought EM waves pass unaffected by other EM waves (at least at intensities that don't fry). After some checks, including on Wikipedia it seems it is exactly the opposite. If you fall into a BH it will take you a normal, probably short time to fall. If you stay outside and look at someone falling in, you see him falling slower and slower, until he may seem to stop. However, in the latter case the following happens: the one falling into the BH emits light that is redshifted more and more, until he emits practically no visible light, thus disappearing from view. He becomes invisible in this way in a short time. It's the exact opposite of you said. to us it would take forever in our timeline. At least I got it *exactly* opposite. Billions? Where does it say that? I don't think someone read the article. We already have the data, we already have the computers, all we needed was the algorithm and this article announces someone invented it. Sounds more like millions than billions to me. Spend a little energy and research Zeno's paradox. That will give you a handle on how to explain the seeming paradox of how 2 BH's can merge. @TopCat22: We may not be able to observe the black holes merging in finite time from our vantage point, but that doesn't imply that they don't merge. The merger still takes place. The generated gravitational waves are not subject to the limitations of the event horizon, as they are alterations in the fabric of spacetime itself, and are therefore not affected by gravity. @TopCat22: We may not be able to observe the black holes merging in finite time from our vantage point, but that doesn't imply that they don't merge. The merger still takes place. Now that's debatable. Experimentally, if you stay at a fixed distance from a BH, you will never observe any particle passing through the BH's event horizon. So practically that doesn't take place. The only way to observe it is to fall into the BH yourself. I think you will go through the event horizon at the same time with that particle and with anything else falling through - but I am reserved about this. I think there's a bit of confusion about time dilation for an infalling object and an outside observer. Someone falling into a BH will notice nothing special (well, he'll get torn apart and irradiated and whatnot but for such a person they would observe no local time dilation). So let's say such a person has a flashlight that emits 1 photon per second in their local timeframe and that it takes that person (again in his local frame) 10 seconds to reach the event horizon. What would an outside observer see? He would see exactly those 10 photons (no more). Only the spacing between them would become wider and the photons would be ever more redshifted. With the last one - if it were emitted exactly when the person crossed the event horizon - taking an infinite amount of time before being detected and being infinitely redshifted. ...there seems to be this odd notion that an infalling object would come to a halt (from an outside observer perspective) but continue to emit ever more photons while slowing down and thus be inifinitely long observable (just more redshifted). But as the above example demonstrates: the number of photons an outside observer gets to see per second rapidly decreases AND the photons are redshifted. Such an object would fade away in a matter of microseconds to undetectability. That you don't get to see register any emitted photons from when after it crossed doesn't mean it just 'hangs there'. A second thing to consider: We can observe BHs merging because we're not looking for photons but for gravitational waves. Gravity has no issue passing the event horizon because it's not a 'massive particle'. Any flash of light that might accompany such a merger comes from any hapless mass near (but outside) the event horizon being frictionally heated. Again, the nebulous prices that represent the "expansion of ignorance of the structure of the universe". How can one copy the theory of black holes and GWs created by black hole collisions, when they do not know what are the black holes and gravity, and how do they arise? The black hole is the place where matter is transformed back into the form of the substance from which matter is formed, which is AETHER. These are renewable processes in nature. A black hole is created where critical gravity is formed from the critical mass of stars entering the black hole. How can two black holes collide if there are billions of stars that are centered around that BH? Another nebulous of science is that science has not found out what gravity is and how it arises and who provokes it, and deceives civilization that there are gravitational waves. If there is a wave of some energy or matter, then there must be a particle that causes it. That's why it's too fatamorgans. so my belief now is that every black hole that has ever been created since the big bang is still intact sitting in the centre of the bubble of its original event horizon formed together with it. These bubbles of event horizons are clumped together like a foam without any of the original event horizons actually merging to become one. There must be a two veils however infinitely thin separating every black hole from its adjacent neighbour. Our own individual timelines as observers started with the big bang and are running still at this time so time has not taken an infinite amount up to now to allow any one black hole to merge with any other. so super massive black holes are composed of innumerable smaller ones inside individual bubbles of innumerable event horizons. This may be where you went wrong....Application of beliefs gets you nowhere when studying physics. You can easily figure out that you are wrong. All you need is a pencil and a piece of paper. You don't even need to write any math but just draw: Just put two black hole masses next to each other and draw where the event horizon is. (Note that gravity overlaps and that there is a point directly between them where their respective gravities cancel out?) Now draw again when they move closer and see what happens. Now just move them closer and see what happens..
to move closer together means that some time must pass. since it takes an infinite amount of time for that to happen .. it has never happened as yet. Time slows to infinity on this side of every event horizon. I''m not saying they will not combine but none have yet combined since the big bang to this day. They are all just sitting there like clumps of foam waiting for the end of time on our side of the event horizon to combine all at the same time... the ultimate big crunch. .....is a distortion of the truth. One group tried to throw some doubt on the first result. They haven't addressed the 2nd and 3rd, and their objections are completely blown out of the water by the detection of the GWs from the neutron star binary merger, where the progenitor can be seen in EM wavelengths. Let them address that. I doubt we'll be hearing from them. I have decided to stay away from the event horizon. Its just a descriptive to visulise event horiozons, its good journalism. In reality it all goes inside at the speed of light. TopCat22> to move closer together means that some time must pass. since it takes an infinite amount of time for that to happen .. it has never happened as yet. All these misleading prices are proof that science does not understand at all, nor understands what gravity is and how it arises. That is why there are many variants with which it tries at least to "prove" from false theories and false claims. Again, I must turn my attention to all of you and the entire scientific community to have to grasp one true fact: ALL IN THE UNIVERSE OF MATERIAL AND ENERGY, it was created from a substance that is filled with a baseline universe. This substance is the basis for the formation of matter and GRAVITATION is a phenomenon that arises as the inherited relationship between that substance and a particular form of matter. This substance is Aether, I accepted it and I can prove that everything is in accordance with natural laws. And you wander still through the dark matter spaces and the curvature space space time, which Einstein made in his "textile industry"
Erm...whut? Where do you get that from. Nothing takes an infinite amount of time to happen. Least of all with black holes. I think you misunderstand what time dilation means. Relativity and theory about this is the greatest possible stupidity invented by compassionate ignoraments and those who do not respect themselves or know anything about their existence and those who formed them and why. Lorenz's transformation and Einstein's staggering long-lasting space-time network are tools against consciousness as powerful pesticides that destroy the plant world. For me, all these people, who believe in relativity, are completely contaminated and they do not know anything about themselves. Whoever does not believe that matter is formed from a substance, no matter what its name, all these people are stupid, and can be angry at whatever they want, they will still be stupid until they understand the structure of the universe and its laws. "gravitational waves from black hole mergers imprint a distinctive whooping sound in the data collected by gravitational-wave detectors"
Every whooping black-hole merger is two more massive black-holes of matter to add to the growing galaxies mass, are a reduction in the matter that theoretically is needed for the galaxies rotation - a theory that has for some time now has been debunked, listing for black-hole mergers indicates we do not know their existence until we hear them. The mass that were only now finding ways of discovering could eventually double the mass of our galaxy. Quite the opposite. Every black hole merger shows that in fact there is matter in galaxies which does not emit light, dark matter. Dark matter as a model states that there large amounts of matter in the universe which doesn't emit light. In the specific case of Cold Dark Matter the extra matter only interacts significantly though gravity and has negligible thermal velocities. CDM doesn't claim dark matter is tiny particles, primordial black holes would actually suffice. In fact this class of dark matter candidate was dubbed Massive Compact Halo Objects, people spent a lot of time in the 90's testing this model though microlensing. It's these microlensing observations that point to it being unlikely that the LIGO black holes are dark matter. However CDM would be unchanged by primodial black hole dark matter. Can we call it a crescendo instead of a whoop? Edit - frequency instead of amplitude, never mind. I don't really know what that means but here's a 5'er. @IMP-9, I brought this up on another thread, so I'll ask the question here as well in fairness: How is it that the missing microlensing from surveys that killed off MACHOs doesn't limit PBHs as well? I feel like I'm missing something here. ....if it were emitted exactly when the person crossed the event horizon - taking an infinite amount of time before being detected and being infinitely redshifted.